Once a range has been defined for a layer, the range slider appears as an on-screen control along the side of your map or scene. You can interactively adjust the minimum and maximum values of the displayed range, or move the entire range up and down. The slider and range settings are fully configurable using the Range tab, allowing you to look through the full range extent of your data using logical increments. You can view the range slider either as a full extent slider or as a collapsed single-value picker. The single-value picker mode also supports configuring an alias for specific range values, such as displaying Ground instead of a FloorNumber value of 0, or Tuesday for a DayOfWeek value of 3. To interact with the slider and its controls, move the pointer near the space where the slider is visible at the right of the map view. When the slider is not being used, you can hide the slider and its controls to simplify its appearance and give the primary focus to the map. When hidden, the range properties are still applied to what is displayed on the map. The range slider will automatically snap to whole numbers if the fields driving the range are integers (whole numbers). The thumbs set the bounds for the currently visible range. You can type values directly onto the slider or use the Current Range group on the Range tab. You can manually drag the thumbs as well. The span equals the difference between the maximum and minimum thumbs for the visible range. Toggle between displaying data based on the range constraints set using the range slider controls and displaying all the data without any range constraints. Toggle between displaying data within the defined range, or outside the defined range. This option is only available when the slider is shown as a full extent slider control. Set the range extent of the slider to the full extent defined on the Range tab. Show or hide the range slider. Hiding the range slider will not automatically disable map range. The current range is still applied, and if the slider is playing, this continues as well. Play a range animation that steps through ranges sequentially. Playback direction, speed, and whether to repeat or reverse can be configured from the Playback group on the Range tab. While playing, the Pause button displays in its place. Move forward or backward in the range by the amount defined in the step settings on the Range tab. The upper and lower values on the slider bar show the range extent of the range slider. The range extent of the slider can be modified by dragging the slider controls beyond the extent of the range slider, clicking the full range extent command, or rotating the wheel button over the range slider to zoom in and out. The colored fill in the slider bar represents the range extent as defined in the layer properties of one of more layers in the group. When range is disabled in the map, you can click anywhere on the slider bar to enable range. It brings the end range slider control to the position you click. For improved performance during playback, allow the range slider to play through once completely. Each range step is cached so the next time you play the visualization, it pulls from the cache and, as a result, draws faster at each step. 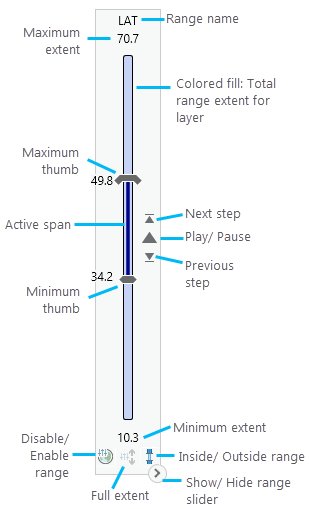 Use the mouse wheel for higher precision adjustment for the slider values. The full extent must be unlocked to scroll the mouse wheel and interactively change range values on the slider. The playback commands for Play, Pause, Next Step and Previous Step have keyboard shortcuts to assist in the interactive experience when viewing range data. The view must be active and the active tool must be the Explore tool in order to utilize these keyboard shortcuts. Play/Pause: Play the entire range of steps sequentially or press the shortcut again to pause. Next step: Move forward in the range by the step amount defined in the step settings on the Range tab. Previous step: Move backward in the range by the step amount defined in the step settings on the Range tab.